jainasoo has no other items for sale. Really fast shipping! Best seller! Thanks! I recommend this product! It makes my skin smoother and looks more younger.I will definitely order again. I'm so happy with the result and im just using it for a week now. With continuos use the skin feels smoother, younger, and my dark spots have lightened up. It is a great value for the price. Good if you are in a budget or if you are new to active ingredient skincare. You will have to mix the powder with the liquid upon arrival and store it in the fridge. 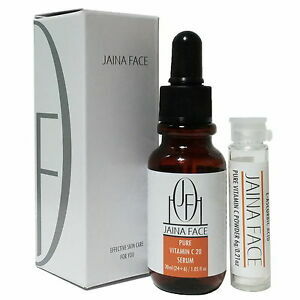 You don't have to and should not spare with it too much as vitamin c will rather quickly oxidize and deteriorate, but it's not a problem as it is cheap. It stings a tiny bit at the first few times if you haven't used vitamin c before but it's ok. Leaves the skin smooth and soft, helps with acne but it isn't a main solution for it. Do not mix with niacinamide,I recommend using it in the morning, SPF is a must because it causes light sensitivity. I've tried so many products to get rid of my acne scars and nothing has worked, but after only a week this helped a lot. Not only are my scars lighter, but it helped treat my current breakout as well. The serum is somewhat thick, so I was worried that it would feel sticky on my skin but it feels amazing. Light and smooth but still moisturizing. Not oily at all.